Animal Play Days are scheduled events where Zoo animals are given an enrichment item that has a specific theme. The theme for this Animal Play Day is Easter egg hunt. 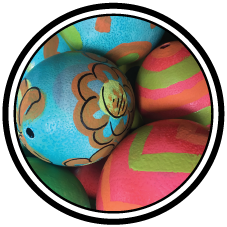 Come watch as our zookeepers prepare an Easter egg hunt for our Zoo animals featuring decorated ostrich eggs, painted eggs and Easter baskets. The schedule is below. Animal enrichment provides novel food and play items to stimulate and entertain zoo inhabitants. It is performed on a daily basis at the Zoo and is a vital component essential to the health and well-being of our animal collection. Locations such as Australia, Small World, Herpetarium (Reptile House) and the Bird department will be putting out additional Easter themed enrichment throughout the weekend.